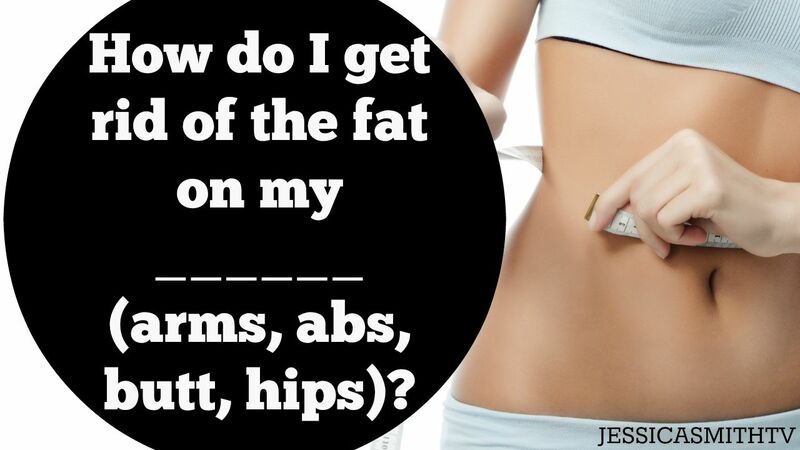 This is a question I get asked almost daily: How do I get rid of the fat on my _____ (insert your favorite trouble zone here)? The short answer? You can’t spot reduce, so you’ll need to reduce your overall body fat in order to target your personal problem areas. I know, I know, it stinks that you can’t choose where you lose – most of us would like a slimmer waist but a larger bust, but it just doesn’t work that way (unless you are a) genetically blessed with that body type or b) surgically enhanced). While you can’t spot reduce, you can build metabolically active muscle all over to boost your metabolism and burn more calories around the clock, which can help you reduce your overall body fat and eventually reduce the area you are trying to target. You don’t want to just exercise that one part of your body because not only can cause muscular imbalances and/or overuse injuries, it’s just not an efficient way to accomplish your goal. Instead, make your primarily focus finding a balanced workout routine that trains your entire body evenly and includes a mix of cardio, strength and flexibility training at the appropriate levels and intensities for you. And remember, you can’t out exercise a bad diet. If you aren’t fueling your body with the right foods or taking in too many calories, it’s hard to create positive changes in your body. If you need to lose weight, focus on making small calorie cuts where you won’t miss them and add in more nutrient rich, energy providing whole foods as often as you can. Finally, don’t forget that training your entire body and fueling with healthy foods is about so much more than slimming your thighs or waist — if you can put your energy into building and maintaining a healthy, energetic and fit body, you can’t help but look good too! Do you have a question I can answer for you in an upcoming QandAWed episode? Please leave it for me in the comments below! Don’t forget to subscribe to our YouTube Channel for our weekly #QandAWed series and free full length workout videos. First of all, I love your videos and the fact that there are so many varieties has helped me to look forward to my morning exercise routine like never before! Thank you so much!! My top reason for exercising is to get a healthy self and the second is to loose some weight. I am 35, 5.4 feet tall, and I weigh 64kgs. My target weight is 56kgs. I am moderate in my food habits and try to include a lot of vegetables cooked in less oil and with Indian spices most of the time. I surely feel great after working our with you every morning and definitely sweat a lot, but when will I start seeing a change in the weighing scale? Looking forward to your yet another motivational answer! Hi, Jessica! I love the workout schedules you send! During summer of strength, you mentioned that we could swap out workouts to make the challenge work for us. There were a couple times I wanted to do that, but I didn’t know which of your workouts to choose. Can you give some tips on how to choose a workout to swap and also how you build a weekly workout schedule? Hi! You can check out our Plug and Play Playlist for organizing our YouTube workouts here: http://jessicasmithtv.com/plug-play-weekly-youtube-workout-rotation-playlist/ Hope that helps! Thanks Jessica, I have a question about body soreness. What do you do for body soreness ? At 56 yrs. sometimes depending on how many days I workout my body is very sore.